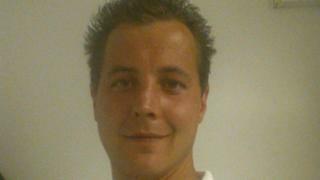 Image caption Gareth Bailey was described by his family as "loved by everyone who knew him"
A man has appeared in court charged with murdering a man at a house near Skegness. Gareth Bailey, 29, died in hospital after he was found seriously injured at his home at Chapman Court, Ingoldmells, on 6 December. Steven Feeley, 39, of Eudo Road, Skegness appeared at Lincoln Crown Court via video link. He entered no plea and was remanded in custody to appear again on 18 January. A 25-year-old woman arrested in connection with the inquiry has been released under investigation. Mr Bailey's family paid tribute to the father of three, saying: "His heart was always in the right place, he was loved by everyone who knew him and lived everyday to its fullest. "He lived for his three children, cherished his brother James, his beautiful sister Rachael and did anything for his mum and dad. "We are going to miss you and love you very dearly, rest in peace son forever in our hearts."